Last week I got the chance to talk to some of the Fathers of Grimbergen Abbey from Belgium who were in here in Toronto for the launch of Grimbergen Dubbel in Canada. I learned a bit about their over 800 years of history including about the destruction of their Abbey no less than three times. Of course I also got the chance to sample some of their double fermented abbey beer and I particularly liked the undertones of caramel in it. After an evening of talking about beer, I realized that it had been a while since I last did a recipe with beer in it and by the time that I got home I knew that I would have to try a Grimbergen Dubbel beer bread. When you think about beer breads you normally think about quick breads but I had already had a few ideas for beer bread sandwiches and quick breads do not hold together well enough for sandwiches. I figured that I would need to do a yeast based beer bread and after contemplating different recipes for a while, I decided to go with the recipe that I am most familiar with, a French bread recipe , and I simply replaced the water with beer. I also used some whole wheat flour which I though would go well with the rich flavoured beer. Although this recipe is fairly easy, it does require a few minutes of kneading and a bunch of time to let it rise twice and then some more time to bake it and let it cool. Even with the effort required, you will instantly know that it was worth it the second those amazing aromas of fresh baked bread start coming from the oven and the addition of beer only makes it better! With the whole wheat flour, this bread is a little heavier than a white bread but it is still pretty light. This bread also has a fantastic, perfectly crisp crust that protects the moist and tender insides. The flavours and aromas of the beer in the finished product is subtle but definitely apparent. Now that I have my loaf of beer bread, I am looking forward to trying it out! Mix the yeast, sugar and butter into the beer and let it sit until the yeast has dissolved, about 10 minutes. Mix the flours and salt. Mix the wet ingredients into the dry ingredients until they form a dough. Dump the dough onto a floured surface and knead until smooth and elastic, about 5-10 minutes, adding more floor if it is too sticky to work with. Place the dough in a large greased bowl, cover and let it rise until it has doubled in size, about 1-2 hours. Punch the dough down, dump onto a floured surface, lightly knead for a minute and let rest for a few minutes. Form the dough into the shape that you want it, place it on a sheet of parchment paper, cover it and let it rise until doubled in size, about 1-2 hours. When forming the dough into the shape that you want it, fold the a bit of the sides under the dough in order to stretch the surface a little. Transfer the loaf on the parchment paper onto a baking sheet, slash the top of the dough a few times and dust with flour. Place in a preheated 450F/230C oven and bake until the crust is golden brown, about 25-30 minutes. Let cool at least 15 minutes. Mmm your beer bread looks delicious. There's nothing better than freshly baked bread. Yum! I love beer bread. Thanks for this recipe! Me gusta la idea de un pan con cerveza, me lo apunto. Looks simple and hearty. The beer must have contributed to that perfect crumb. I'm making this! I often make challah with my children but have been wishing to make other varieties of bread. I do like flavorful bread and I have some extra beers in the fridge. What kind of beer did you use? A dark beer, amber, etc? Does it matter? I guess I'll have to try it to figure it our. This almost looks like a light rye bread – love the colour! 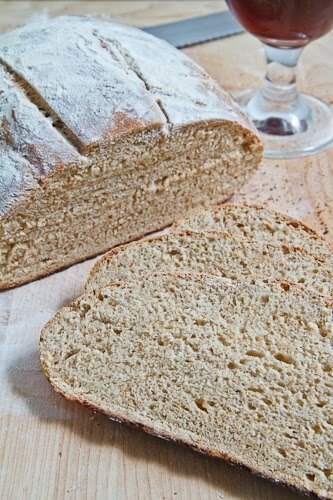 My mom used to make a beer bread, but with all white flour – think I'll give this one a go though! Couldn't hurt to be a tad healthier, right? As someone scared of baking I really admire how your breads always wonderful… and beer bread? Sounds delicious! This is just the recipe i have been looking for. Can't wait to try this come the weekend. i've never made beer bread but after reading the Welsh Rarebit recipe I have to make it. the cheese sauce sound delish. Lael HazanL: I used a Gribergen Dubbel in this loaf but any beer will work. Each different beer will add different flavours and aromas. I made a beer bread in January. I use Heineken. Also, mine was yeast-free, only use baking powder/soda. This bread was a huge hit. It will definitely be part of my regular bread-making repertoire. Great recipe! I did a post about St. Patty's Day feasts and linked to this recipe in a shoutout. Thanks for posting it! Here's my link. I made this with Guinness the other day for a St. Pats movie day party along with a guinness cheddar dip recipe I found. The bread was fantastic. Incredibly moist and yet hearty. Big winner! I made the bread again today and replaced 1/2 cup of the white flour with spelt flour. It turned out great. This came out awesome when I made it with Guiness. Going to give it a try with your Caramelized Onion Grilled Cheese Sandwich recipe later. yum! I used 2 c white whole wheat, 1.5 c unbleached AP + 1 Tbl wheat gluten (baking at 6000' can go wonky without extra gluten and I was out of bread flour), super yummy with a Fat Tire and Alton Brown's Welch Rabbit and steamed broccoli for a TV watching party. Great tips. Thanks for sharing them with us.